DETROIT -- BMW's decision three years ago to make its EfficientDynamics fuel-saving technologies standard on most models has done more than just lower fleetwide CO2 emissions. 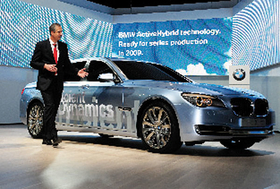 Klaus Draeger, the carmaker's head of r&d, said EfficientDynamics has made used BMWs more attractive to car buyers. "We now have 2-year-old cars with EfficientDynamics and these cars have more stable residual values," he said. "In those countries, we are becoming extremely successful," he said. Draeger said that, despite cost pressures, BMW is maintaining its r&d focus on environmental technology. Said Draeger: "You need cars that fascinate people but at the same time are highly efficient."